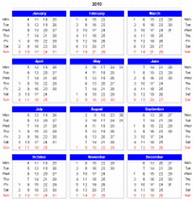 This page offers adjustable calendar spreadsheets you can use to look up dates or to print simple wall calendars. 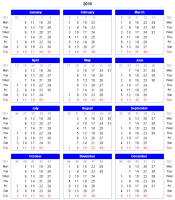 You can set the calendar's year and starting month, and the day with which the week begins; you can choose between calendars with and without week number display; and you can also change their look to give them a personal touch. 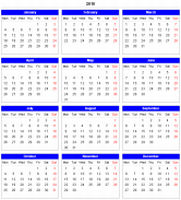 The calendars are free - you can download the calendar spreadsheets at the end of this page. *ISO week numbers: following the week numbering rules of the International Organization for Standardization. Each week numbering option is contained in a separate spreadsheet (three in total); but every spreadsheet contains all display options for days and months (days on top and on the side; 12 and 18 months). Click on a thumbnail to show a bigger image. The calendars are free. They work with Microsoft Excel 2000 or a newer version. 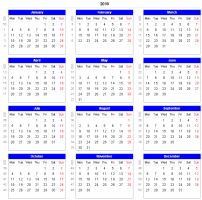 The latest calendar version is 2.2e (13 Apr 2010). Every spreadsheet contains all display options for days and months (days on top and on the side; 12 and 18 months).